The Boston Public Library has almost 90 prints and drawings by Maurits Cornelis Escher (1898-1972), better known as M. C. Escher. 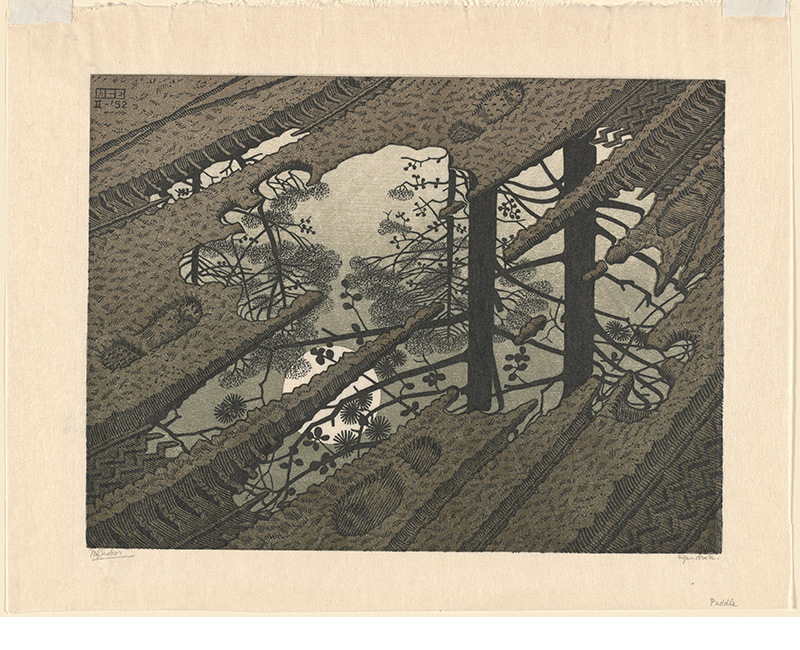 The Dutch draftsman and printmaker was born in Leeuwarden, The Netherlands. Escher created his first prints in 1916 while a secondary school student in Arnhem. From 1919 to 1922, he attended the School for Architecture and Decorative Arts in Haarlem, during which time his studies turned from architecture to drawing and printmaking. In 1921, Escher began to travel extensively in Italy, settling in Rome in 1923. Escher married in 1924 and lived in Rome with his growing family until moving to Switzerland in 1935, to Belgium in 1937, and back to The Netherlands in 1941 during the first years of World War II. Escher’s frequent trips exploring the Italian countryside between 1921 and 1935 strongly influenced the subjects of his early prints, which included portraits, still lifes, and landscapes. During this period, he also created woodcut illustrations for three publications: the booklet Flor de Pascua (1921), an emblem book XXIV Emblemata (1932), and De vreeselijke avonturen van Scholastica (1933). Traveling to Spain in 1936, Escher visited the Alhambra for the second time and visited the mosque in Córdoba. The renewed exposure to Arabic design occasioned an important change in his work--he became fascinated with geometry and symmetry and how those abstract design elements could be incorporated into his representations of the natural world. The images in his later prints are created from within his mind rather than representations of the physical world. He explored how to represent people, animals, and objects rising from the flat page and then returning, as well as how to represent the endlessness of infinity. As a result, Escher’s work has been recognized both in the art world and in the scientific community, including at the Stedelijk Museum in Amsterdam during the International Mathematical Conference in 1954. Boston Public Library’s collection shows the broad range of Escher’s talent as a printmaker. The richness of the collection is thanks to the generosity of the Boston collector, John D. Merriam. 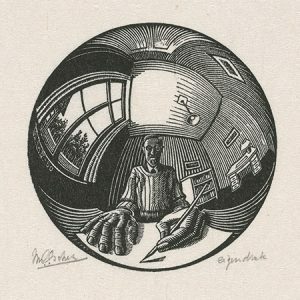 Beginning in the 1980s, Merriam began to make gifts of works from his Escher collection; he bequeathed the remaining prints in his collection to the library upon his death in 1994. The Associates of the Boston Public Library underwrote the digitization of these prints. 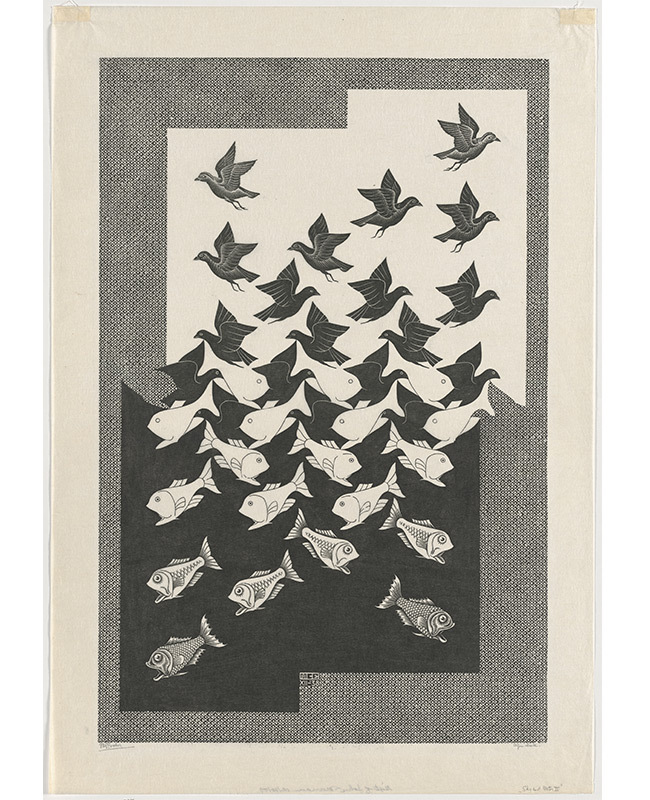 To see more of the BPL’s Escher prints visit the Digital Commonwealth. 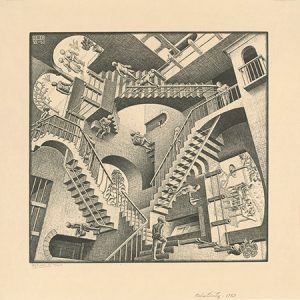 Escher worked in a number of printmaking techniques, including lithography, drypoint, and mezzotint. However his preferred print techniques were woodcut, wood engraving, and linoleum cut.